The days are getting cooler here now. Summer has long since waved her final farewell and when the wind blows you can feel the first hints of winter creeping into sight. Thankfully the unpleasant colder snap also brings with it the joys of winter scarves and gloves, hot chocolate with marshmallows and an almost permanent pot of home made soup in the kitchen. One of my favourites is pumpkin soup. It’s a little sweet, its smooth and creamy, and its warm and comforting to eat on a wintery day. So, whenever I can overcome my loathing for the job of chopping and peeling a pumpkin, I make a big pot of pumpkin soup. What’s left after I’ve had all I can eat is then portioned out and frozen for future emergency pumpkin soup cravings. One of the sad downfalls of Dublin is that pumpkin is not sold here most of the year. For some reason it’s just not considered to be a valid food here!? The one time of year when I can stock up on pumpkin is Halloween when they’ll sell big delicious pumpkins, not for eating but as decorations. They just don’t know what they’re missing! When I bought my pumpkin for soup last week the checkout girl picked it up, turned it over and gave us a puzzled look before asking, “Is this a pomegranate?”. Speechless. 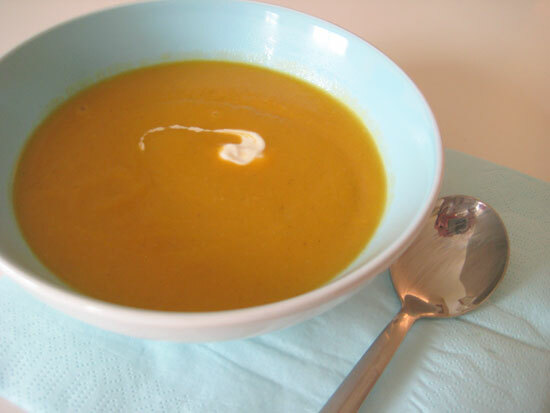 The mixture of spices and flavours in this pumpkin soup recipe may seem a little odd at first but trust me, it works really well. Adapted from an old recipe by kiwi kitchen maven Alison Holst. Melt butter and cook onion and garlic in a large pot until soft but not browned. Prepare pumpkin and potatoes and add to onion with the water, spices, stock and sugar. Cook until pumpkin and potato are just soft in the center when pierced with a knife. Puree the mixture and add enough extra water or milk to thin the soup to the desired consistency.